Woodring Law handles Florida Appeals, Trial Litigation & Administrative cases, Charter Schools, licensing, bid protests, Constitutional Cases. 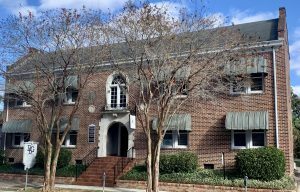 Our office is located in Tallahassee, Florida in a historic downtown building within walking distance of the State Capitol, many state agencies, the Florida Supreme Court, the Leon County Second Circuit Courthouse, and the Federal District Court for the Northern District of Florida. This location is convenient for dealing with the many state agencies headquartered in Tallahassee, and matters such as appeals to the Florida Supreme Court. However, we have a statewide practice, from Pensacola to the Florida Keys, and all the areas in between such as Jacksonville, Gainesville, Orlando, Tampa, St. Petersburg, Sarasota, West Palm Beach, Miami, Naples, and Ft. Myers. We also handle appeals to the Eleventh Circuit and the U.S. Supreme Court. From time to time, upon special admittance, we will handle cases in other states. We are selective about our clients and the cases we take. We try to only take on client matters when we can add value providing accurate advice that avoids legal problems,or getting a good result when the law and facts support a client’s position. Our reputation is on the line for each and every client. We do not take many of the cases we are contacted about, even when someone wants to pay us, if we do not think it is case that we can see a way to get a good client result, whether we are defending or prosecuting a case. Each party to a legal dispute may have the right to have an attorney, but they do not each have the right to our representation. When we discuss a potential case with you, we promise to always be candid in discussing the merits of the case, and the potential return on your legal investment. Professional and Occupational Licensing and Discipline cases. Our clients include individuals and local Florida businesses, national and international companies, and state or local governmental entities. We represent either plaintiffs or defendants, depending on the merits of the case. If you have a case that you believe we can help you with, please contact us. If we accept your case, we can partner with other attorneys if the needs of the case make that beneficial, because of the size of the case, the time within which proceedings must be initiated, the geographic location of the case, or other unique factors. Our principal member, Mr. Woodring, has literally worked with hundreds of attorneys on different legal projects, so he has invaluable experience in partnering with or supervising other attorneys when that will benefit the client. For example, he has worked with attorneys from Kirkland & Ellis; Hogan Lovells; Holland & Knight; White & Case; Carlton Fields; Ausley & Mcmullen, and Rumberger, Kirk & Caldwell. We often co-counsel with other attorneys on appeals, particularly if the attorneys have represented the parties as trial counsel. We welcome referrals from trial counsel for state, federal and administrative appeals. We handle most state and federal appeals, except for criminal, immigration law, and family law appeals. © 2019 Woodring Law Firm. All Rights Reserved.